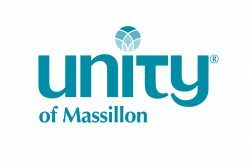 Nancy was a long-time, active, member of Unity Church of Massillon. Gardening was her passion. She loved flowers and had many gardens at her home. Nancy provided flower arrangements to the church every Sunday. During the summer months, she used flowers from her garden. Every summer Nancy had a picnic at her home for the Wonderful Women of Unity along with their husbands. We enjoyed her lovely ivy covered home, flower gardens and her fish pond. Nancy was very creative and talented not only with her flower arrangements which included ikebana (Japanese) arrangements, but with her paintings. She painted faces of Native Americans on stones. Many church members have her works of art. She painted in water colors and did pencil drawings. She often entered her art work in shows. Nancy loved animals. She had dogs and cats in and around her home. She loved horses and loved to ride. She belonged to the Tri-County Trail Association. She and her 2 daughters and their husbands would do trail riding and camp out. 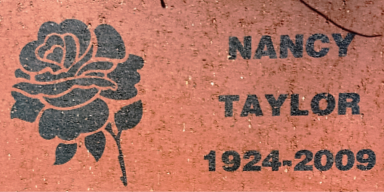 Nancy has a brick in the Memory Garden which her daughter, Christy Poland, maintains. The garden includes flowers, a small maple tree and an angel in the middle. The garden is surrounded by the memory bricks. Nancy was a very caring, loving person who remains in our hearts and minds. Yes, we could very well call her “a woman for all seasons” – our Nancy Taylor with her multiple talents, interests, and activities. Nancy was born in Crawfordsville, Indiana, with both parents in the teaching profession. Her father was a football coach, also a teacher of Civics, Economics, and World History. He was a religious man and later served as Choir Director at Canton’s United Brethren Church. Not as involved in religion, her mother passed along the love of flowers and the talent for creating unique floral arrangements to her daughter. For over 15 years, Nancy has shared her talent by displaying her beautiful Sunday flowers in our Unity home. Nancy’s father’s job brought the family to Ohio, where he had a lifetime contract with McKinley High School in Canton. A love for animals is a very important part of Nancy’s life, she says she sometimes feels more at ease relating to them than to people. She lives on a mini-farm in Massillon and now has just one dog and five cats. She has raised sheep, cows, and her horse, Misty, in the past. However, Misty now resides on her daughter’s farm with their horses. A yearly trek to Hocking Hills State Park in southwestern Ohio continues to be a family event. With her two girls and their husbands, they all make the 3-hour journey on gaited horses. The steeds take special steps that are more rider-comfortable. Of course, Nancy saddles up her beloved Misty for the trip. Nancy’s artistic abilities also include sculpting, which she studied while living in Chicago, and doing portraits on Lake Erie stone, a red, smooth material. Unity entered Nancy’s life during a personal crisis. She had long doubted Christianity’s inflexible beliefs and at one point converted to Judaism, teaching herself Hebrew. She feels that Unity literally saved her life, providing strength to overcome some difficult physical and emotional challenges. To her, Unity’s concepts are a realistic look at living as they provide a “different” way of viewing situations and relationships. The metaphysical teachings brought Nancy to the significant realization that God’s spirit is not only all around us, but also WITHIN US. During some 20 years at Massillon Unity, Nancy has served as a Board Trustee and is a founding member of WWU. Currently, she is an alternate on the Board of Trustees and she continues to bless us with her lovely floral arrangements every Sunday. We do, indeed, appreciate our “woman of all seasons” and her significant contributions.